Do you know what the recent news is for Muthoot Finance NCD Bonds? Yes, Muthoot Finance NCD Bonds of sep/oct-2015 has opened for subscription few days ago. Muthoot is launching secured and un-secured NCD’s in this current issue of Sep/Oct 2015. Let’s know more about it here. Muthoot Finance NCD (Non-Convertible Debentures) yield rate is as high as 10.41% per annum. Muthoot is launching secured and un-secured redeemable NCD’s to the amount of 250 crores with an alternate to keep over subscription for another Rs 250 crores comprehensive to total of Rs 500 crores. 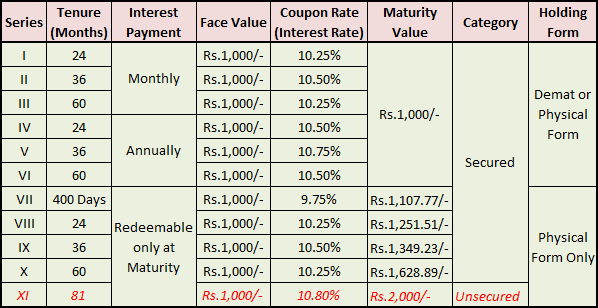 There are 11 options with these NCD bonds and it consists of 400 days to 84 month tenure. Moreover, Muthoot Finance issue has 11 options of NCD’s and 1 to 10 are secured and 11th is unsecured. Here is explanation of secured and unsecured NCD sep/oct-2015. In secured NCD’s the assets are backed up for interest and principal. In case of unexpected thing happening to company performance, the company would wind up but the investors of NCD would still get their principal investment and interest. In unsecured NCD bond of Sep/Oct 2015, no assets are backed up for principal and interest. If something happens to company, and company gets closed investors would be provided normal priority in repayment of capital and interest. Also, it would be after repayment to other secured creditors/vendors. 1. Issue start date is 7th September 2015 and Issue end date is 7th October 2015. 2. You can get Non-Convertible Debentures (NCD’s) in eleven different options. 3. Interest is payable monthly, annual and cumulative, according to the option of NCD. 4. The face value of NCD bond is Rs 1000. 5. The minimum investment is for 10 bonds it means that you have to invest for minimum of Rs 10,000 and beyond that you can invest in multiple of 1 bond. 6. Non-Resident Indians (NRI’s) can’t invest in these NCD’s. 7. ICRA has given a rating of ICRA AA. It means that a high degree of safety for payment of principal and interest. Why invest in Muthoot Finance NCD Bonds? 1. It is the largest gold loan NBFC Company. 2. It offers secure NCD’s also where your money is safe. 3. IT has attractive yield of 9.75% to 10.41% per annum. 4. You can double your money in 84 months (7 years). To apply for Muthoot Finance NCD Bonds, you should have a demat account and apply through your demat broker online. You can also apply for it in physical form by visiting the company website and downloading the application form. Prepare the cheque and submit at the collection centre. Investing in Muthoot Finance NCD Bonds is beneficial. Are you going to invest in any NCD these days? If yes, which is the best NCD bond you should get? Share your opinions with us and also leave comment below if you have any confusion regarding it!